FACT CHECK: Do These Photographs Show a Protester Paid to Disrupt the Kavanaugh Confirmation Hearings? Viral images shared with misleading information about protesters resulted in harassment and death threats. Photographs show a protester being paid to disrupt the Senate confirmation hearings of Supreme Court nominee Brett Kavanaugh. False accusations alleging protesters at confirmation hearings for U.S. Supreme Court nominee Brett Kavanaugh were paid as part of a nefarious liberal conspiracy to block his confirmation resulted in intense harassment for two people whose images were posted online along with misleading information. Internet trolls widely shared a photograph of demonstrator Vickie Lampron being handed cash by an organizer while she waited to enter the U.S. Capitol, where she would be one of the first persons to be arrested protesting at the Senate Judiciary Committee hearing for Kavanaugh on 4 September 2018. Although she was merely given a small amount of cash so she could pay post and forfeit fines, conspiracy theorists falsely claimed a photograph of her was evidence that protesters were paid for personal gain in exchange for disrupting the hearings. While it’s true the photograph indeed shows Lampron being given money, she wasn’t being paid a fee in exchange for protesting. 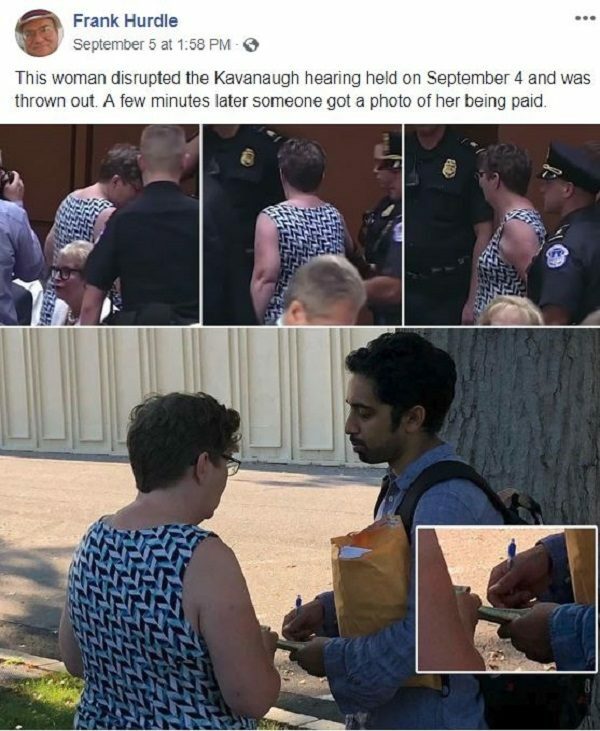 The man wearing a backpack in the photograph is Vinay Krishnan, a consultant who helps organize legal support for the progressive activist organization Center for Popular Democracy (an organization that has been heavily involved in organizing protests against Kavanaugh’s confirmation). Krishnan told us the money was raised via small donations from around the country, and protesters were given about $35 to pay related fees in the event they were arrested; if they weren’t arrested, the money was to be returned. Both Lampron and Krishnan faced online harassment as a result of the misinformation spread online about them. Krishnan received racially-tinged death threats, forcing him to close down his social media accounts, and a laundromat that had offered Lampron a job reportedly rescinded the offer as a result of the controversy. Vickie is not a paid protester. She felt very strongly that she wanted to go to D.C. on behalf of herself and her granddaughters because she feared she was seeing women’s rights on the line when it came to this Supreme Court nomination. We fundraised to send our members down so they don’t have to pay out of pocket. But they don’t make any money. Adam Schindler’s tweets and video were picked up and widely shared by a large number of social media users and junk news sites, including the Gateway Pundit (which incorrectly referred to Schindler as a “reporter”), Your News Wire, and conspiracy trolling site Infowars. 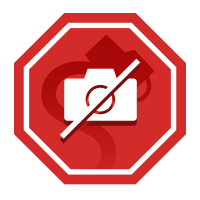 The images of a “paid protester” have popped up repeatedly since the 4 September hearing in the service of false claims that Kavanaugh’s confirmation process was being picketed for profit instead of principle. I went back to the public ticket line mid-afternoon and approached the gentleman from the photos. I greeted him and the moment he saw me he hurried away. A woman sitting on the bench saw this and stepped in. She identified herself as Jennifer (Flynn Walker), the protest organizer from a group called Center for Popular Democracy. We had a very civil discussion about what they were doing and why. I made an audio recording of this conversation and it is posted in its entirety below. I have also transcribed some key moments in the conversation and posted them below. During our 12 minute discussion, a half dozen protestors gathered around and some participated. The gentleman in the photos did not. The protest leader confirmed her group was providing cash to protestors. She took issue with my use of the term “payment”, saying the provided cash was only to be used to pay the fines. I was unclear how she was able to enforce this vital distinction for her. But nonetheless, she, and the half dozen members surrounding us, all confirmed her group was giving cash to protestors. She then asked if I was interested in knowing the source of her cash. She had good instincts! I didn’t even have to ask. I could sense her pride as she told an emotional story about how it was crowdsourced from donors across the nation. I asked if that was the only source of funding for this protest. I had no reason to doubt the truthfulness of her story. But I did doubt it was the only source of funds. She was quick to ask a clarifying question before answering, as her organization is funded with tens of millions of dollars from George Soros. A fact I’m sure she was familiar with. But she said very precisely, “That’s how we pay for the fines, yes.” And that was that. Billionaire philanthropist George Soros contributes large sums of money toward progressive causes (the Center for Popular Democracy does receive funding from Soros, for example). He is also the boogeyman in many right-wing conspiracy theories that often veer into anti-Semitism, in which he is typically portrayed as a puppet master orchestrating a vague world take-over. We found no evidence, however, to support the claim that Soros was directly paying out money to Kavanaugh hearing protesters, nor did we find evidence to support accusations that persons demonstrating at the hearings were there because they were being paid to protest. The New York Times. 4 September 2018. The Washington Post 16 September 2018.